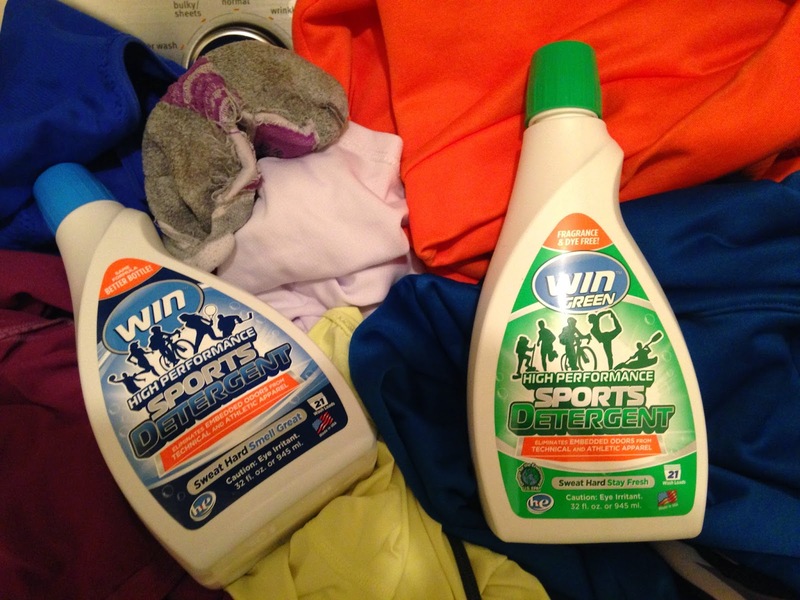 I was recently provided the opportunity to review Win Detergent as part of a FitApproach Campaign. Let's face it. Sweaty clothing can create quite the stink. Now let's x4 and we have my family. 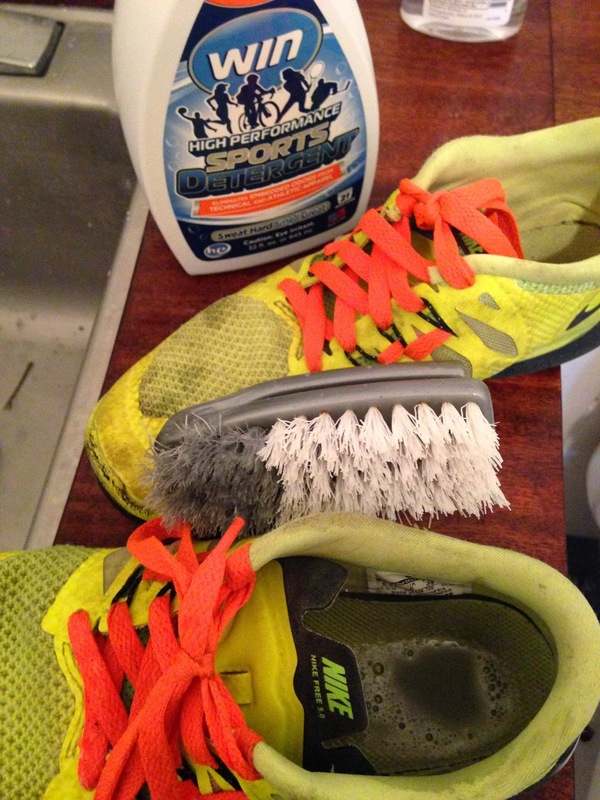 With running, soccer, dance, basketball - we all create quite the stink. I do laundry all of the time, but it's still not fast enough to combat the stink. Let's be honest, regular detergent doesn't quite cut it. Sadly, I've tossed quite a few of my favorite running shirts/shorts due to the stink. I just wish i had known about Win beforehand. Perhaps it would have saved me some heartache. Last weekend - both kids played their Round Robin Soccer games. Izzy played an hour of soccer and Tucker played 2.5 hours of soccer. Then I went away for the weekend for the MDI Relay. When I returned home on Sunday afternoon - I was greater with the stench of the kids sweaty clothing from soccer the day before, Ward's sweaty gross clothing, and all of my sweaty half marathon clothing. I was grateful for WIN! How does it work? Science is not my thing. Math is. Check out the link for more information on how Win works! Win comes in two different formulas: Blue for the original very light/clean smelling scent and Green for the no-fragrance/no-dye option. Both work great! I have a great giveaway for my readers! 2 FULL sized bottles of WIN detergent: 1 regular and 1 green. Giveaway begins today and ends 11/1/14. Enter through the rafflecopter below. If you don't want to wait to see if you won, go ahead and use this great code to save $1 from a bottle of WIN from Amazon: WINGIVE1. Oh goodness, my husband and I need this. We have a few pieces of clothing that you put on, and are like, did I already work out? I LOVE this stuff! I use it all the time! Oh I've tossed more tops than I care to share. This sounds like a great product! I live in a house with 3 pets, 3 kids, and a smelly husband-- I have lost count how many items of clothing I have thrown out. The towel with the banana smooshed in it, shoved under someones seat in my car take the prize as the foulest. I haven't had to throw away any yet, but I know its on the way! I've had to throw out a few shirts which made me so sad! I have had to throw away a few shirts! I've thrown out many things of both mine and my husbands.